Note: This is part 2 of my recovery, for the first part, read this post first. A full month has now gone by, it feels a lot longer. The first few days after the crash were miserable beyond belief, I could barely do anything at all, any movement sent shocks of pain through my body, As the bone was broken and separated it was especially painful when movement would cause the ends to touch. I was somewhat happy to be considered for surgery, but frankly I totally underestimated just how huge an impact it would have on me. I assumed I would be in and out of the hospital and that I would be back to normal in a few days. I am now over two weeks into my post-surgery recovery and I am still not back to normal, not by a very long way. I almost cannot imagine riding again this year. Maybe in a couple of months I will be fine, but by then the weather will be crappy and it will not really be the time to go out. I just made a physiotherapy appointment, it is not for three week, so even if PT is a miracle cure, I have another three weeks of limited mobility and a doubt about how it will heal and if it will ever return to normal. Ibuprofen with codine seems to be better than paracetamol. The worst night ever last night. I think I pulled a stitch, or maybe I stabbed myself, or something, because all night I had tremendous amounts of pain from my shoulder, I took paracetamol, codine, ibuprofen and thought about mixing it all with vodka, but that sounded a little too dangerous. Nothing touched it though. I spent the entire night awake trying to get comfortable. I moved from three to six to one pillow and as many cushions as we own, but no amount of anything would fix it. I woke up with an incredibly painful neck and sat on the side of my bed for an hour just trying to get it to stop hurting. Pain was a 8-10 pretty much all night and into this morning. I finally fell to sleep in the early hours of the morning. Then awoke with the usual dream, I was once more crashing into the car, and launching myself over the front. I woke before I hit the ground. As usual I awoke in a cold sweat. 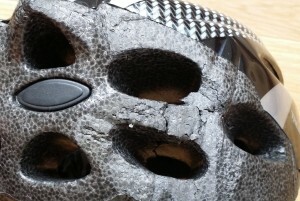 I took a look at my helmet earlier, it shows the signs of the crash graphically, it is soft, cracked and just plain wrecked where it hit the ground. 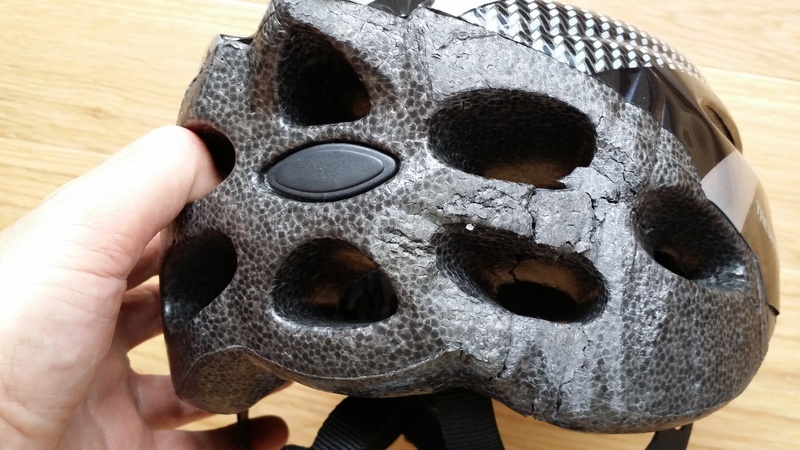 When you consider the damage to my helmet it is not too difficult to image how badly the back of my head would have faired in the crash had I not been wearing it. I cannot stress to anyone just how important it feels to me that helmets are an essential part of the bicycling attire. When you consider the damage to my helmet it is not too difficult to image how badly the back of my head would have faired in the crash. I really cannot imagine riding without a helmet in the future. We walked up to the island and I looked at it from every angle, I still have no idea how the driver felt it was a viable thing to overtake me. He surely was distracted ? Neck pain ! I woke up at midnight, having fallen to sleep around 10PM with serious neck and shoulder pain. I took some ibuprofen and sat on the side of my bed while the pain subsided. I woke a second time at 3:30AM in huge pain (8/10) and with pins and needle in my left arm and hand. I took more ibuprofen and sat on the edge of my ned again. Major muscle spasms this afternoon (3PM) and more ibuprofen/codine to get me through the day. Arm movement is getting better. I can raise it to close t0 90*now – still extremely tender and my shoulders hurt (both sides) my neck feels like someone has hit me behind my ear with a baseball bat. Extremely tender. Bad night. Muscle spasms pretty much all night. Took codeine, paracetamol and later ibuprofen. Feel terrible this morning. Shoulder and upper arm ache and fingers have pins and needles. Took way too many Ibuprofen today. Made an appointment to see the nurse on tuesday – a stitch is sticking out of the wound ! A bad night, probably worse than Thursday night, almost constant muscle spasms and a deep ache in my shoulder that nothing seems to fix. I nearly blacked out with pain trying to pickup a cup of tea with my left hand ! I slathered myself in topical pain killer and took ibuprofen before bed. A better night, perhaps it is the pain killing gel, perhaps I am just so tired that I have no choice but to sleep regardless. I woke at 4:12 with my usual nightmare, once more it was as clear as the day it happened. My upper arm muscles feel like I have been working out too hard, yet the only thing I lifted yesterday was a fork. My neck is a little better today, but looking over my left shoulder is pretty much impossible without serious (8/10) pain. I got through the night mostly, dreamed about flying over the front of the car, awoke before I hit the ground. I took pain killers at 2:37 and again at 6:30AM when I awoke. I had to travel to London today, the journey there was pretty rough, the crowded underground made for a painful journey. I made it through the day fairly well, then left early to avoid the crush, even then the 17:10 from London was crowded out. Luckily I got a decent seat and was able to protect myself from the worst of the busy commuters. Major muscle spasms for much of the night, I took pain killers at 9:45, 3:12 and then at 7:30. The nurse tried to pull the stitch and cut it, but it was stubborn. It is also infected, so she squeeze the wound and cleaned it up a little before dressing it with an Inadine dressing. I came close to blacking out when she squeezed the puss out of the wound. Pain spiked to maybe 9/10 or so. Not a terrible night for once, woke up twice, once with cramp in my upper arm, the second time with muscle spasms. At 7AM I had pins an needles from my neck to my fingers. A large area of my shoulder, chest and upper arm is still numb. Doctors visit revealed that the infection is not too bad and they are refraining from giving me antibiotics. Need to go back next week to make sure that it is healed well. Bad night again – muscle cramps and the crash dream returned once more. Neck is extremely sore on the right-hand-side too. Took several Ibuprofen+’s in the night. Today the cramps have eased, but I am extremely sore and stiff. 17:00 – pins and needles from my shoulder to the end of my little finger – oddly my thumb is fine ! Pain is down to 4/10 most of the time. I did a little cycling today. On the stationary bike at the gym. It is not too bad unless I put any weight on it, then it is agony. But it is a different agony now, it is the pain of muscles doing something that they have not needed to do in a long time. My upper arm aches like crazy for a few minutes when I try to move it beyond about horizontal. But then it settles down and its OK again. Took some Ibuprofen+ at 8AM, then again at noon. I have no strength in my arm at all – I am heading to physical therapy tomorrow – this will be a nightmare. Last night was not too bad, I had no pain killers and only woke up once in pain. it died down fairly quickly though. Bad night. Really bad night. Muscle cramps and spasms all night long. I took paracetamol at 11, 2AM, then again at 5AM. Spent much of the night propped up in bed in agony. Nothing that I could do would reduce the pain at all. The morning was bad too, I worked from home but could not get comfortable, propping myself up with cushions helped. By later afternoon I am feeling better, more Ibuprofen+ and plenty of tea seems to have helped. A better night – I was so incredibly tired last night that I really had no choice but to sleep I guess. I took two Ibuprofen at 10PM and took several cushions to bed. I woke up at 4AM, took two more. Went back to sleep until 6:30AM. Physical Therapy / Rehab appointment went fairly well. I have much reduced range of motion in my arm compared to my right arm and serious amounts of pain when raising my arm above shoulder height. I have some exercises to do which hurt like crazy. The rest of the afternoon was pretty good – a significant dull ache, but not too bad. Not a terrible night, the dream returned just once and I took just a single Ibuprofen all night. I had to travel into London today for work. This is pretty much a nightmare for me at the moment. A combination of carrying a laptop bag and dealing with the crowded tube makes this rather unpleasant to say the least. I go to the Clapham office OK and made it through the meeting due to a combination of ibuprofen and tea. Coming back was painful, on the tube I was jostled and was forced to use my left arm to stop myself from hitting the ground. I grabbed the pole at waist height and twisted my shoulder. The pain was of the scale. I let go of the pole and crashed into another commuter, who managed to stop me hitting the ground. I took two Ibuprofen on the train at 17:00, then two more before bed. The dull ache became a fierce ache all night. Several Ibuprofens later I managed to sleep. I was comfortable during the day. Managed to get through the exercises without tears too. Feel like I have made no real progress in the last week. The Police called today. It seems that the driver has no insurance. The car is insured, but he is not a named driver, so technically he has no insurance. I am worried about how this is going to effect my bike repairs. Apparently he has been less than forthcoming with the Police. I am going to be interviewed and make a statement either tomorrow or early next week. I hope that they throw the book at him. I have been through rather a lot and I think that Karma needs to work her magic here. I’m aware that I am heading for the end of month two. I had naively hoped that I would be about OK by now. Best nights sleep in a long time. I took no drugs all night and slept from about 11PM to 5:45 this morning. The ache is now back to dull, but deep. 15:00 The police called, they are going to interview me on Tuesday at 10AM. I gave them a link to all of the photos that I have taken along the way and also the map that I drew early on to show where the crash occurred. It really sounds as thought karma is going to bite his bum. I did feel slightly sorry for him. But then my should spasmed and I was reminded that I have gone through hell these last weeks and I stop that line of thought quickly. 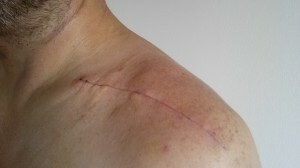 17:30 – Scar itching like crazy, numb area means that I cannot relieve the itch. 04:12 – awake again, more pain killers, more muscular pain. It feels like heavy bruising and a muscle strain almost constantly. Cannot sleep. 05:17- gave up trying to sleep. 10:30 – Feeling a little better, but very, very tired. 15:12 – just woke up from a nap on the sofa. Neck is agony, shoulder is agony pain is about 9/10 – on the edge of unbearable. 17:05 – feeling a lot better, ibuprofen has helped….Major pins and needles in my left arm and hand….. Better sleep, but still very uncomfortable. I had ‘the dream’ again last night. Once more I woke with a start before I hit the ground. The scars is still not healing fully, the tiny stitch is still sticking out and it is red and sore in that area, when it is especially sore if I press on it, it oozes creamy ‘liquid’. It is very sore and irritated by an shirts. Walked to the seafront and all was not bad. On the way back though pins and needles set in again and I really found that I was in agony for the last half a mile or so. Took a couple of ibuprofen+’s before bed. Not a bad night at all. Still very hard to get comfortable and stay comfortable, but generally I made it through the night OK.
Today I have a follow-up at the hospital, I will finally get to see the metal work. I am both looking forwards to this and dreading it in equal measures. It is almost time to start month three. I hope that it will be the third and final instalment of my recovery, but somehow I am sure that this story will roll on for some time now. 15:25 – I have now seen the X-ray – it is about as bad as I expected. The consultant is concerned that the outer screws may be too long, this might be the reason for the pain that I am feeling. He made me an appointment for ‘3-4 weeks time’ to see the doctor that did the surgery. 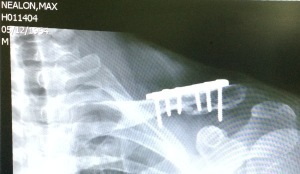 If the pain has not subsided, then I may need surgery to remove the long screws and replace them with shorter ones. I am really not sure that this is a good idea. I hated surgery, I hate the idea of them having a second attempt at this. All I want, right about now, is to go back to a life where constant pain was not a factor. 17:00 I called BUPA, I have coverage, so I wondered if I could use it – the answer is an affirmative, this is great news. I will call tomorrow to see if I can get myself sorted sooner rather than later. Not a terrible night. I woke up at 5:15 in pain, but overall not too bad, I am nervous about the prospect of more surgery, but in general I am positive now that I know that BUPA should be able to help me. 9:30AM – spoke to BUPA and they recommended a local surgeon, Mr Packer and gave me the authorisation code and secret handshake. I had to call the original surgeon’s secretary and eventually persuaded her to send over the details to the new guy. 10AM – Police interview. This was fascinating, they asked many questions that I had not thought about. I walked through the crash and everything leading up to it and the actual impact. I feel happy whatever happens to him, I hope he will learn a lesson. I now have an appointment on Tuesday at 8:30AM to see Mr. Packer.